Diwali, the Indian the festival of lights, celebrates the return of Rama and Sita to the kingdom they had long ago been banished from. Just as the Diwali holiday was approaching, I happened upon this version of the classic Ramayana for children in our library. It is unique in two ways. First, it is a graphic novel, with very traditional Bengal artwork. And second, it tells the story of Rama from a woman’s point of view. Apparently this is not that rare, and there have been versions since the 1600’s giving a different view of the Ramayana. However, this is probably the first and only Ramayana for children in a graphic novel form. I thoroughly enjoyed the re-telling of this classic tale. For any Waldorf or other classroom studying classical India, this would be a very novel way to introduce the story to children. What I love about this version of the Ramayana is how clearly it depicts the tragedy and uselessness of war. I don’t know how to categorize this version of the Ramayana for children. Is it a classic? Well yes, but it’s written in contemporary language. Is it historical fiction? Well, yes, sort of, and no, since many believe this tale happened. So I put it in all the categories. 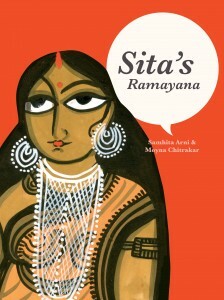 No matter how you categorize this children’s book, it is a wonderful addition to the re-telling of Sita and Rama.